Arcelia Hernandez wanted to know why street names are misspelled on a map of Austin at the airport. On the floor of Austin airport, right by the baggage claim, there is a cryptic map made of terrazzo tile. It represents downtown Austin, but not quite as it is today. The story of how it came about reveals much about Austin’s past – and maybe its present. A problem with the map can be found in the streets: Their names are all wrong. The numbered streets are named for trees. The north-south streets, which are named for rivers, are spelled strangely. But it was “Guadaloup” that really got to her. Austin street names misspelled on the floor of Austin-Bergstrom International Airport. After contacting the airport a couple times, Hernández reached out to our ATXplained project to get to the bottom of the mysterious map. Here’s what we found. The map on the airport floor is a re-creation of the first map ever drawn of Austin. It was commissioned in 1839, before Texas was part of the U.S., when President Mirabeau Lamar chose this land along the Colorado River to be the capital of the new Republic of Texas. “Lamar picked a man named Edwin Waller to come up here and build this place,” says Jeffrey Kerr, a local historian and author. He says Waller arrived in the spring of 1839 with about 200 men, free and enslaved, to clear the land and lay out the streets. Included in that group was a surveyor named L.J. Pilié. He’s the man who drew the first map of Austin. 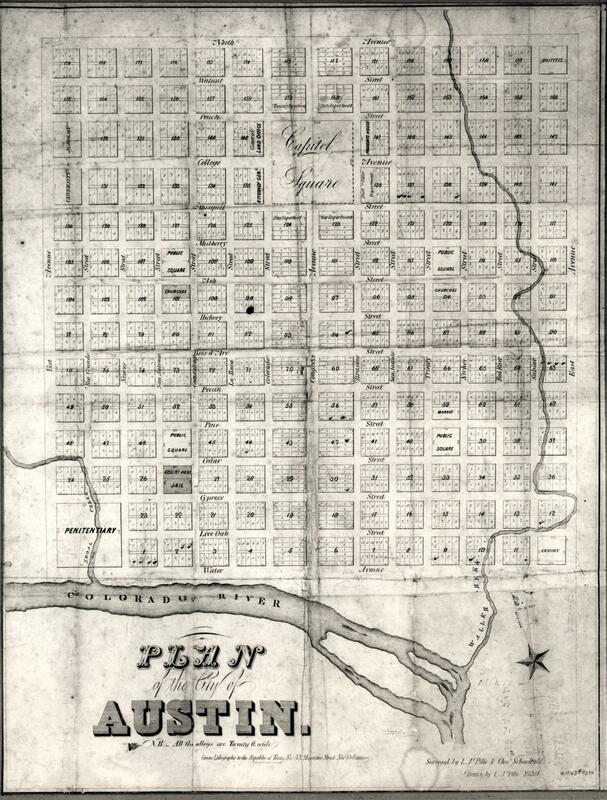 The original plan of the City of Austin drawn in 1839. Before heading to Austin, Pilié went to Houston, where he got into some financial trouble. Drawing a map of Austin was important work. Back then, Texas had no money, but a lot of land. The government needed the map to sell lots to fund itself. Not everyone liked the idea. Sam Houston hated it. The mapmakers named the east-west streets after Texas trees (they were later changed to numbers) and the north-south streets after Texas rivers. Except on the Pilié map, the rivers are spelled differently: “Brassos,” “Labaca” and “Guadaloup” all make an appearance. Kerr says a lot of the misspellings make sense. They’re an attempt to spell Spanish phonetically. “Guadaloup” is the exception. But there is a reason Pilié made this choice: because the Anglo founders of Austin were saying “Guadaloup” much like many people still do today when referring to the street. In fact, even before Austin was founded, the river after which the street was named was referred to the same way. So when you hear people say “Guadaloup” in Austin, they may be butchering the Spanish, but they're also staying true to the way Pilié named the street on the first-ever Austin map. But it may not be that way for much longer. “It used to be if you’re from an Anglo family that’s how you're going to say it," says Lars Hinrichs, a linguist at UT Austin. KUT tested it out, asking about a dozen strangers on Guadalupe Street to pronounce the word. Most used the Spanish pronunciation. A few who said “Guadaloup” clarified that they preferred the Spanish way. On Aug. 1, 1839, proving that real estate speculation has been with us from the start, Austin’s founders held an auction to sell the future city. It happened under two big oak trees that still stand downtown in Republic Square. He also made about $9,000 commission. But one person didn’t: L.J. Pilié, who had recently had his property seized to collect debt in Houston. A short time later the auctioneer realized that he was missing more than $3,000 of his commission – money that was traced back to Pilié. Kerr thinks Pilié likely made his way back to New Orleans, where he found success as a surveyor. And that’s the end of his story. It turns out some of the misspellings on the map at the airport don’t match Pilié’s original spellings. They came much, much later. "I’m surprised it’s taken this many years to come up,” laughs Jerry Ludwig, one of the people who designed and installed the terrazzo map at the airport in 1999. “It was a big project for us at the time." Ludwig had to clear the plans for the map with the city and when he got the design back, he says, he was surprised to see the street names had been changed in strange ways. The city told him that's how the street names appeared on the original 1839 map. “My first question was, 'Who's around from 1839 to know this? '” Ludwig says. He went back and forth with the city, he says, but eventually installed the names exactly as specified. “It was really went-over and back over so many times, by so many different people,” he says. The errors were noticed after the job was done. In a short news report in 1999, the Austin Chronicle talked to Janet Seibert, the airport’s cultural coordinator about it. KUT reached tried to interview her, but the city’s cultural arts division wouldn't allow it. In the Chronicle story, she said the misspellings were going to be fixed. But almost 20 years later, they haven’t been. And they probably won't be. Raiders Of The Lost Archive: Is This Building Off Shoal Creek A Top-Secret Warehouse? When Eric Howard drives by the building at 4400 Shoal Creek Boulevard, he can’t help but think of Indiana Jones. Specifically, the final shot of Raiders of the Lost Ark, when the U.S. government loads the Ark of the Covenant into a crate and then carts it off into a vast warehouse, presumably filled with similarly sequestered treasures.